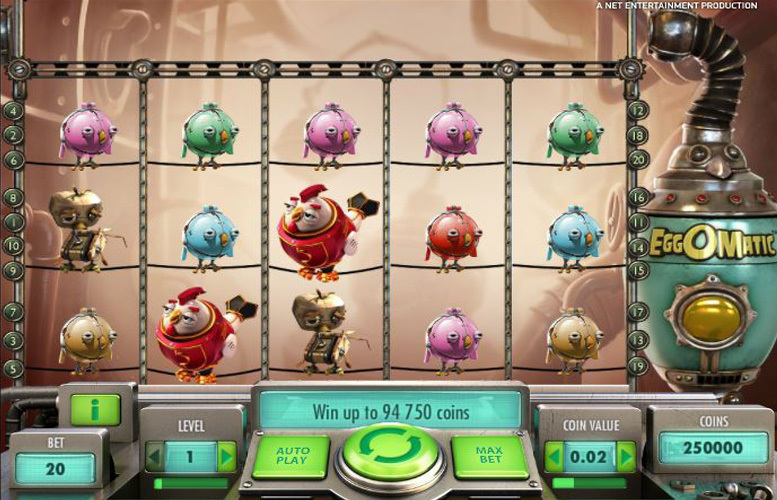 EggOmatic is an innovative and different five reel and three row slots game, themed around a mechanical chicken factory. The game has a theoretical return to player percentage of 96.5%, 20 pre-set paylines and allows players to alter their bet level and coin value. Alongside this, the game also features a fun conveyor belt graphic which introduces special features like wild substitutions and free spins to enhance gameplay. Taking a slightly different approach to many slots games, EggOmatic has a number of interesting features that demand a closer look. We have done just that below, as well as dissecting the game’s top jackpot, analysing its paytable and explaining how players can set betting limits. Whilst the special features of this slot are fairly involved and take a little explaining – as we will do a bit later – the way in which players can win through the game are mercifully simple. Winning combinations across the game’s 20 pre-set paylines are those which include three or more identical symbols consecutively from left to right. The most valuable symbol within the game is the large red mechanical chicken symbol, and five of these along any payline delivers winnings equal to 1000 times the bet level. That means that at the highest bet level of ten, the top jackpot equates to exactly 10,000 coins per line. At the maximum coin value setting of £1 therefore, that jackpot would be worth a total of £10,000. Alongside that main way to win, players can also supplement any jackpot with coin wins resulting from the ‘Feature Eggs’ of the game, which will all now be explained in greater detail. This feature results in max coin jackpot of 94,750. The special symbols involved in playing EggOmatic are essentially split into two parts; the Wild symbol which appears on the reels and the ‘Feature Eggs’ which appear on the conveyor belt above the reels. That conveyor belt is empty at the beginning of the game but can have a ‘Feature Egg’ added to it randomly from the right of the screen after each spin. With every spin, any ‘Feature Egg’ on the conveyor belt moves one spot to the left regardless of if another is added, and the features they refer to are only activated if a Wild symbol appears on the reels. 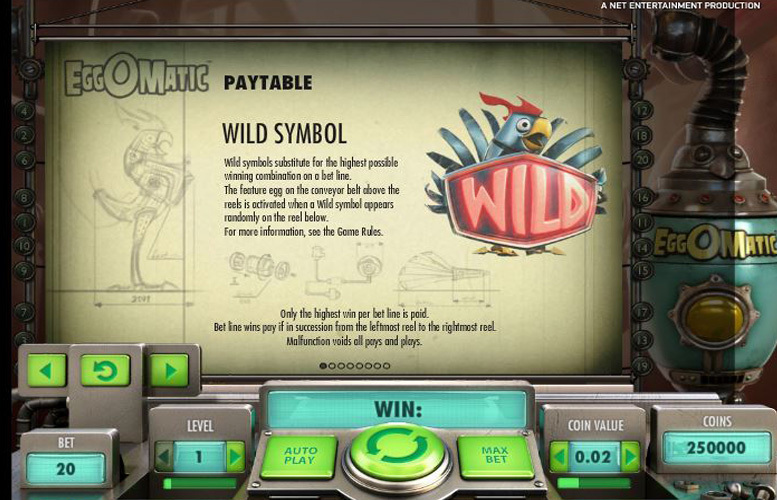 The Wild symbols can appear on any reel and substitute for any other symbol during the main game and during free spins. They will always go towards making up the most valuable possible combination for any payline and also serve to activate the game’s ‘Feature Eggs’. They do so simply by appearing on a reel when a ‘Feature Egg’ is on the space of the conveyor belt directly above that reel. There are four different types of ‘Feature Egg’ within the game, which are called the ‘Spreading Wild Egg’, the ‘Coin Win Egg’, the ‘Free Spins Egg’ and the ‘Surprise Egg’. The Spreading Wild Egg turns the Wild symbol which activated it into a spreading wild which turns all adjacent and diagonal symbols into additional wilds. Those additional wilds cannot activate further Feature Eggs. 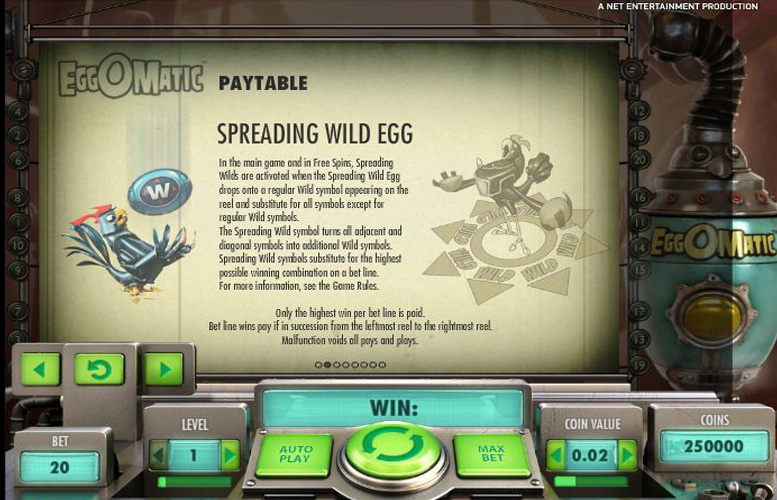 The Coin Win Egg, meanwhile, immediately provides a coin win to the player equal to the value randomly displayed upon the egg itself. 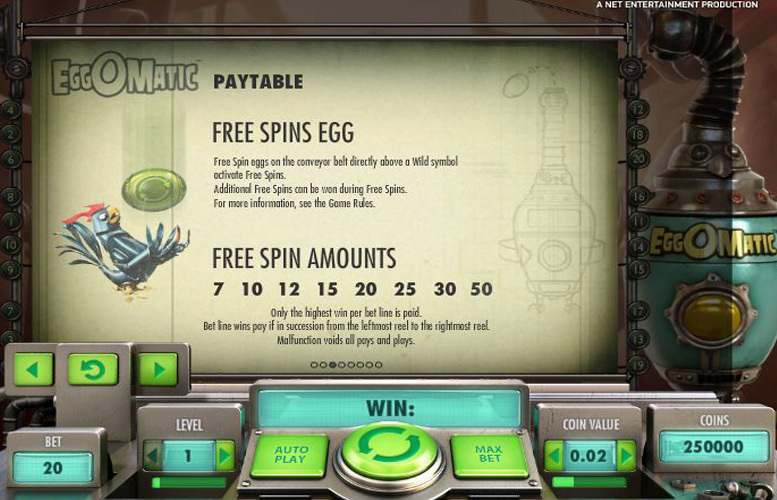 Perhaps the most valuable Feature Egg within the game is the ‘Free Spins Egg’ which when activated, immediately awards the player the number of free spins displayed upon the egg. Those free spins are played at the same bet level and coin value as the spin that activated them but during free spins the conveyor belt always features a full five Feature Eggs. That means that the chance of triggering features is dramatically increased and further free spins are in fact activated whenever any Free Spins Egg is present anywhere on the conveyor belt during the free spins. The ‘Surprise Egg’ can be any one of the other three Feature Eggs and which it is, is only revealed once it is activated. All of the symbols of the EggOmatic game are themed around a mechanical chicken factory and as such are generally either robotic chickens or similarly mechanical eggs. The most valuable of the symbols in the game is the large red mechanical chicken symbol which pays out at a level of 1000 times the player’s bet level if five of them line up along a payline. Behind that most valuable symbol, the next most lucrative are the other large mechanical chicken symbols, starting with the pink mechanical chicken. Five of those particular symbols along a payline provides a win worth 700 times the bet level, which can equate to 7,000 coins per line. The amount that a winning combination pays in coins depends upon what bet level the player sets per spin and that, together with the coin value that they can also choose, determines how much they wager per spin. There are ten different bet levels from 1-10 to choose from and each level adds an extra coin per payline to a player’s bet. Meanwhile, there are seven coin values from 1p to £1 which determine just how much each of those coins is worth. That means that the minimum bet per spin for EggOmatic is just 20p (wagering one 1p coin per payline) and the maximum is £200 (wagering ten £1 coins per payline). EggOmatic is a really fun and interesting slots game that offers something a little bit different to players. The conveyor belt element of the game and the way in which that uses ‘Feature Eggs’ to introduce the special features of the game is really innovative, and makes the gameplay that little bit more engaging. That being said however, the features themselves are little more than the standard offerings that you would expect from any slots game, with free spins being the main headline. Being straightforward though, doesn’t mean that they are not worthwhile and the ‘Coin Win Egg’ and ‘Free Spins Egg’ particularly can provide really nice additional winnings per spin. The game also impresses in terms of the level of control it provides to players over their betting amounts, by allowing them to set both bet level and coin value. The top jackpot per line of 10,000 coins is also pretty generous (being worth up to £10,000 depending on bet level and coin value) and the max win of 97,450 coins from the bonus feature is even better. This game has a rating of 4 / 5 with 532 total reviews by the users.